On October 11, 1998, a large group of Second Amendment supporters gathered at the base of the Bunker Hill Monument to make a political and a social statement. On the political side they were holding an informational rally against the new "gun control" regulations being imposed on law-abiding citizens as of October 21,1998. One of the new laws highlighted stated that veterans would no longer be able to carry guns in a parade unless the firearms were inside of a case. (This has since been ammended). Other laws make many currently owned firearms illegal (without special permits) with no way for an owner to know what guns are in which category. Courts have previously ruled such laws "little more than a trap for the unwary." Many of these laws have recently been passed in California and Ohio and more recently have been ruled unconstitutional in court challenges in those states. All legislators who voted for the new laws in Massachusetts were made aware of the unconstitutionality of them before a vote was cast. Even though (in their Oath of Office) they solemnly swore to uphold the constitution, a majority of members of the House and Senate still chose to vote for such a law. On the social side, the Freedom Rally Committee wished to make a contribution to a worthy charity to let society know they are good neighbors who are often demonized in the media due to a few decades worth of equating guns with crime and violence. None of these people (lawful and responsible gun owners) are criminals and none are violent. Nearly half the homes in our Country have law-abiding gun owners living in them. These people are the same cross section of individuals that attended the rally. Doctors, school teachers, homemakers, and virtually every other profession was represented. The organizers of the Freedom Rally had actually been turned down (as donors) by a charity whose manager stated "I want to make it perfectly clear I have a problem with the Second Amendment." The committee was then approached by a representative of L.A.R.G.O. (Lawful And Responsible Gun Owners) who suggested "Warm the Children" as a worthy cause. 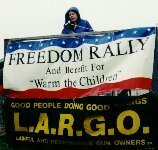 "Warm the Children" is a group that cares more about helping children than whether it is socially acceptable to support the Second Amendment or any other part of the Constitution of the United States. After listening to many inspiring speakers, the MC, Ann Conceison (a civil rights advocate and radio host from New Hampshire) asked those who were physically able to make a symbolic walk down the Freedom Trail to the State House. 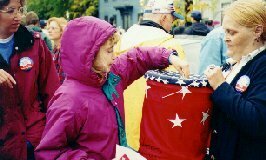 Hundreds of participants, standing in the rain, cheered when asked to make a social statement by dropping a small donation into a red, white and blue bucket for "Warm the Children." As a result, a sizable donation was turned over from a benevolent group of people to a benevolent organization.